THE eyes of the world were on the centre of Downend when Olympic medal winner Jenny Jones went through on her open-top bus tour this spring. Jenny won bronze in the women’s slopestyle at the Winter Olympics. Now there are possible plans to commemorate Jenny’s achievement. One idea is to create a landmark sculpture on the roundabout. Another suggestion is to have a bronze plaque in the pavement under the new Parish Information Board about to be installed alongside Sainsburys. Downend & Bromley Heath Parish Council have debated the proposals but now wants to open up the discussion to residents before proceeding. 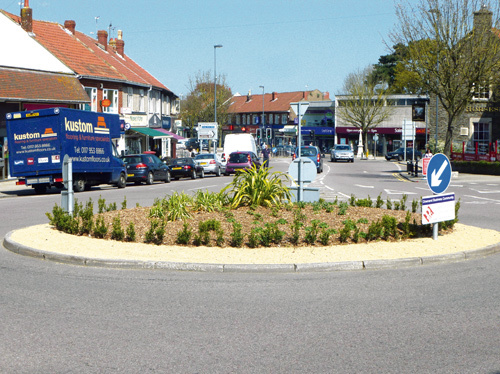 Parish clerk Angela Hocking said councillors felt a sculpture of some sort would be a welcoming and defining landmark on the roundabout, which has recently been replanted with perennials and shrubs instead of wild flowers. “The parish council would be very glad to receive ideas for what or who we could celebrate in a sculpture. “We would also love to hear from anyone who could help with the design or with sponsoring of such a sculpture. “Maybe you would prefer just to have the new planting as it is. This is your chance to have your say,” she said. Mrs Hocking added that the council had already had positive feedback about the replanting and members were looking forward to more colour over the summer. “Much as we loved the wild flowers that looked so beautiful there two years ago, they only look good for a short time and are vulnerable to the sort of wet spring we had last year, so the parish council decided to replant,” she said. *The council has also honoured Jenny with one of its parish champion awards, which was handed over by the chairman, councillor Graeme Riley.